Chapel Allerton and Roundhay Brownies were among the winners of Fairtrade Leeds’s city-wide ‘Design a Fairtrade T shirt’ competition. The competition was open to youth groups across the city. 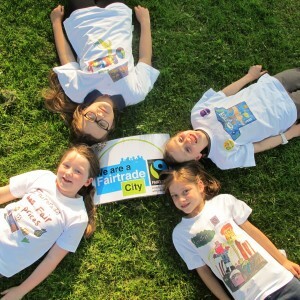 The competition received 315 entries, with the winners having their designs printed on a Fairtrade T-shirt. The winners pictures here are (clockwise from the top) Alice Garth Cameron from 3rd Cross Gates Guides, Maddie Plant from 7th Roundhay Brownies, Aine Kelly from 2nd Chapel Allerton Brownies and Josey Eard, from 1st Chapel Allerton Brownies. Yorkshire, the UK’s first Fairtrade Region has had its status renewed by the Fairtrade Foundation. Adam Gardner of the Foundation congratulated Fairtrade Yorkshire on its success in promoting Fairtrade to the good Yorkshire public and to specific groups including: local authorities, the media, businesses, schools, and other places of education, and faith and community groups. Fairtrade supporters in York celebrate the renewal of Yorkshire’s Fairtrade Region status. Yorkshire has enjoyed its status now for 16 months and during that time Fairtrade Yorkshire has gone from strength to strength. Highlights from this period include the visit of banana farmer, Aimeth Angulo, to Yorkshire. Aimeth toured the region from Immingham to Skipton and Malton to Hebden Bridge, by way of: Bradford, the East Riding, Harrogate, Holmfirth, Hull, Leeds, Sheffield and York. At each location she attended events, gave talks and spoke to local people to tell of the benefits that Fairtrade brings to producers from poor communities. Fairtrade Yorkshire has also helped organise several school conferences and has issued Fairtrade in Yorkshire schools awards to recognise the achievements of many schools in promoting Fairtrade. 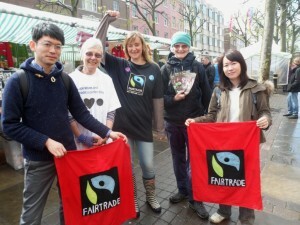 Local Fairtrade campaigns in Yorkshire have enjoyed a great deal of success in the past year and a half. 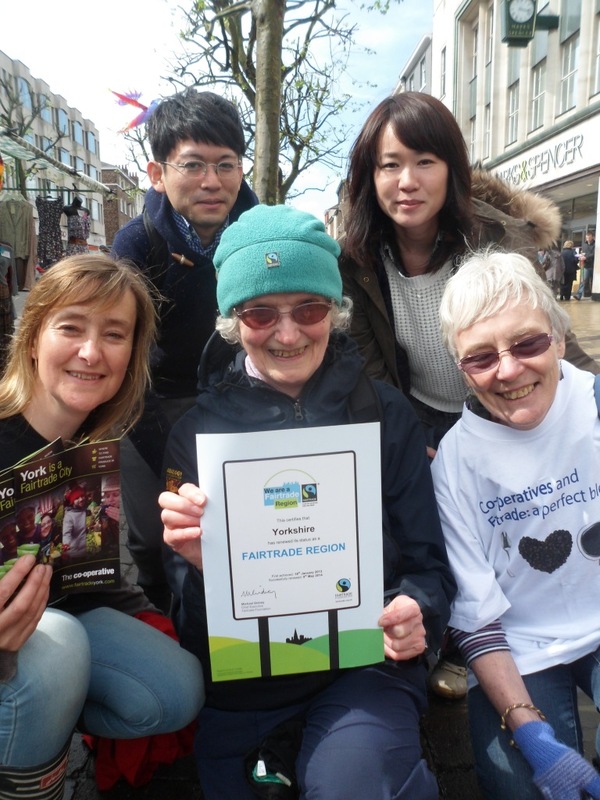 The Fairtrade Towns family is soon set to welcome Horsforth, Immingham, Keighley and Skipton. Fairtrade Doncaster has enjoyed a relaunch, significantly raising the profile of Fairtrade in the Borough. Encouraging more towns and boroughs to work towards Fairtrade status. Collaborating more closely with Development Education Centres to promote Fairtrade awareness in schools. Increasing our media profile in South Yorkshire and in feature publications. Holding more events and conferences in different parts of the region. International World Fair Trade Day (10th May) was celebrated in York with the holding of a Fair Trade market in the city’s Parliament Street. A wide range of Fairtrade food and beverages was on sale, alongside fairly traded crafts, clothes, jewellery and accessories. Local Fair Traders included: Fairer World, Alligator wholefoods, York Scarves and Peruvian Kids. On the following day, a Fair Trade service was held at St. Lawrence’s church to mark the 10th anniversary of York as Fairtrade City. Fr. Tim Jones lead the service and Sue Maskill of York Fair Trade Forum introduced the confession with the words of Martin Luther King. Coordinator of Fairtrade Yorkshire, Mark Dawson, gave the address and talked about his research at the University of Leeds which is focussed on church action on Fair Trade. The Fair Trade service at St. Lawrence’s. 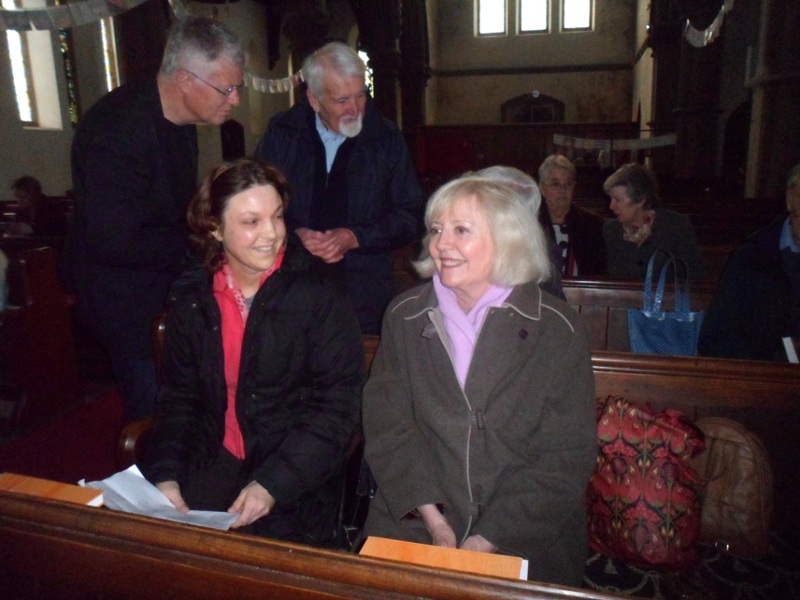 Following the service worshippers enjoyed a celebration in the church hall with refreshment and cakes and a chance to operate a pedal powered smoothie maker.